We've encountered Matt Bolton's critique, and I use that term advisedly, of Corbynism before. In the market place of ideas his niche is a self-described Marxist take on Corbyn and his works. Funnily enough, this is just the kind of Marxism Matt's mates in Progress find congenial - which should tell you something about the direction of his politics. Anyway, Matt has been at it again in the New Statesman with Frederick Pitts, and so here we go a second time. After a rough couple of days re: Labour and anti-semitism, the last thing we needed were further examples. But we got them. We saw a round robin open letter organised by a member of the We Support Jeremy Corbyn Facebook group that, groans, argued Corbyn is being targeted by a secretive "special interest group". And then it emerged Christine Shawcroft had opposed the expulsion of Alan Hull, a prospective council candidate who had posted a "Holohoax" article onto Facebook. She claims she was unaware of this, which is fair enough, but to not notice he was getting done for allegations of anti-semitism and not think "hmmm, this warrants a further look" is unconscionable. She was right to resign as the chair of the disputes panel, but she should step down from the NEC altogether. Here then we have two instances of "left" anti-semitism. One that can be put down to ignorance of anti-semitic tropes, which is symptomatic of the unpolished and unsophisticated politics you'd expect to see when hundreds of thousands of "new people" enter the political process. And the other related to the internal culture not of the Labour Party, but of the groupthink of a section of the anti-war/anti-imperialist far left and hard left. Add to that a perception that Corbyn and his leadership are constantly under siege, which they are, you can understand why (without for a moment excusing it) how in these contexts anti-semitism isn't taken seriously and are dismissed as factional attacks. In their argument, Matt and Frederick take it a step further. We've noted before the tendency of conspiracy thinking to be a gateway to full blown anti-semitism, yet they argue this conspiratorial politics more or less marks Jeremy Corbyn's outlook. They suggest, without any evidence it has to be said, that Corbyn talks about society being under the hoof of the "1%" who stitch up and rig the game at the expense of the 99%. Their version of Corbyn argues that the removal of these people would allow for socialism to emerge and usher in a world of freedom and plenty. In Corbyn's politics, the job is to find the guilty parties and remove them. This, of course, is utter rubbish. If this is the calibre of their coming book on Corbynism I'd recommend giving it a miss. Yes, Labour has occasionally indulged populist rhetoric (it even did under The Master from time to time) but his politics are not. Corbyn's politics are fundamentally Bennite and remain within the envelope of Labourism. What does that mean? A number of things: a commitment to a "mixed economy" (i.e. an expanded state sector side by side with a market economy dominated by private enterprise), a Keynesian approach to investment in industry by the state, and an enhanced role for trade unions. Like Benn before him, Corbyn believes there is a role for limited economic democracy via cooperatives, employee stakes in firms, and alternative forms of ownership, as well as more democracy and accountability within the public sector. You can find all this in Labour's 2017 manifesto and the debates around it since. Also like Benn before him, Corbyn believes these reforms can be achieved by securing a Labour majority in Parliament via a general election, but must be augmented by the party becoming a massive movement of millions. This is to keep the Labour government honest and offer an extra-parliamentary lever against the opposition such an administration would face from bosses and other civil society actors. In practice it means a kinder, gentler capitalism, and would open up opportunities for a politics aiming to go beyond capitalism itself. And whether you agree with this or not, it is much more complicated than the goodies vs baddies caricature offered by Matt and Frederick. The inordinate focus on the crimes of Israel within the British left – far outweighing the attention given to the chemical slaughter currently inflicted by Bashar al-Assad for example – results from the portrayal of Israel as the evil “1 per cent” of the global community, a state whose very existence is the source of all suffering in the Middle East, if not the world. What drivel. There are plenty of criticisms of Israel on the British left, ranging from the centre left who focus their critique on the right of Israeli politics and selected human rights abuses, to a more fundamental critique of Israel as a colonial project and, therefore, an institutionally racist one. Even here you find divisions over whether the Israeli state has a right to exist or not. And then there are other layers of analysis positioning Israel in the global system of power politics, and its role as a client of the West generally and America in particular. You pays your money and you makes your choice. Nowhere, however, do we come across any analysis claiming Israel is part of the "evil 1 per cent". In fact no one on the left continuum ranging from Progress to the SWP, from Labour First to the most degenerate Stalinoids operates with an analysis this superficial. All are rooted in an analysis of Israeli politics, and as we move out from the mainstream to radical arguments, an embedding in a critique of political economy and the international system. Sometimes this can manifest itself in crude anti-imperialism and an overstatement of Israel's power, but it's not conspiracy theorising. Matt and Frederick have to set up these straw men for the grand reveal: that a conspiratorial approach has nothing in common with a Marxist analysis. Consider me thunderstruck. They turn to the work of Moishe Postone, who died in February, to argue that the object of the critique of capitalism should be capitalist social relations themselves. Postone has his virtues, but you can only suppose this is an original argument if you know no Marx at all. What is the body of work Marx left behind if not an unravelling of the impersonal dynamics of capitalism, a modelling and critique of its fundamental dynamics, and an appreciation of how the commodity form conditions, well, everything? Marx was also very clear that persons and personifications in his work condensed the social relations they typified and, in his writings on politics, represented - though with varying analytical power. Where Matt and Frederick are right is rooting conspiracy theorising in fetishistic thinking. The commodity circuit, the operation of capitalism as an impersonal, amoral, unconscious and directionless beast presents the world to us, its inhabitants, as personifications. It can appear as if the system is rigged by a shadowy cabal, and the complex shifting (and shafting) attending capitalism is their doings, but it isn't. What hampers our comrades' theoretical position, quite apart from a tenuous relationship with the facts, is a refusal to properly situate their argument. There's their wafer thin case for classifying Corbynism as a type of conspiracy thinking and therefore a species of reification, which implicitly means it's illegitimate, but they fail to note the conspiratorial themes they ascribe to Jeremy Corbyn (remember, they're critiquing his thought, not his support) are common place, if not banal features of bourgeois politics. Consider the Labour right and its refusal to explain Corbynism beyond the machinations of sundry Trots and troublemakers - no evidence of an appreciation of the social relations at work there. And the Tories - bad GDP figures are about liberal chunterers talking the economy down, industrial unrest the result of unspecified militant troublemakers, the relative decline of Britain the fault of Brussels' bureaucrats. On and on it goes. With their greater reach, influence, and embeddedness in the institutions of government and media, why do they see it fit to ignore the mainstream if conspiracy thinking is so powerful and terrifying? I digress. By forgetting to situate their analysis in the context of wider bourgeois politics Matt and Frederick egregiously abuse the thrust and spirit of Marx and Postone. Their empty critique of Corbyn's positions allows them to construct not just a distorted view of his politics, but a false one. In other words, they have either maliciously, or as a result of their unthinking ignorance of their subject matter, created another phantom, another personification whose appearance obscures its essence. Call it what you like - a hatchet job, a cynical hit, whatever you do it's a rum business when self-described Marxists use Marxist categories to mystify the social world instead of rendering it intelligible and knowable. Matt has form for this. His original piece, 'The Terrifying Hubris of Corbynism' (now mysteriously disappeared from the internets by Matt himself) was of similar character. In an analysis peppered with unused, decorative Marxist categories, he argued Corbynism wasn't an authentic left movement because it lacked x, y, z characteristics. It wasn't as ideologically coherent as the Militant Tendency, for example. This approach, needless to say, ain't a Marxist approach. Instead of taking social relations, the movement of hundreds of thousands of people into the Labour Party, their trajectory, and their common characteristics as a means of explaining Corbynism, Matt imposes his characterisation and, yup, distorts it. Good for getting noticed, not so good if you want to know the social world for the express purpose of changing it. Yes, Corbynism does have its problems. As a movement it is uneven and parts of it are prone to conspiracy thinking and, therefore, anti-semitism - almost as if the two are an outer shell of an immature radicalism. But the way these problems can be dealt with is not just through a programme of education, as helpful as that would be, but by understanding our movement ourselves. In this endeavour Matt and Frederick's intervention is singularly useless. A nice fairy tale to help their establishment promoters and friends sleep at night, but nothing else. "This study, supported by the Community Security Trust, takes an in-depth look at attitudes towards Jews and Israel among the population of Great Britain, both across society as a whole, and in key subgroups within the population, notably the far-left, the far-right, Christians and Muslims. "It introduces the concept of the ‘elastic view’ of antisemitism, arguing that as antisemitism is an attitude, it exists at different scales and levels of intensity. Thus no single figure can capture the level of antisemitism in society, and all figures need to be carefully explained and understood. "It finds that only a small proportion of British adults can be categorised as ‘hard-core’ antisemites – approximately 2% – yet antisemitic ideas can be found at varying degrees of intensity across 30% of British society. Whilst this categorically does not mean that 30% of the British population is antisemitic, it does demonstrate the outer boundary of the extent to which antisemitic ideas live and breathe in British society. As such, it goes some way towards explaining why British Jews appear to be so concerned about antisemitism, as the likelihood of them encountering an antisemitic idea is much higher than that suggested by simple measures of antisemitic individuals. In this way, the research draws an important distinction between ‘counting antisemites’ and ‘measuring antisemitism’ – the counts for each are very different from one another, and have important implications for how one tackles antisemitism going forward. "The research finds that levels of anti-Israelism are considerably higher than levels of anti-Jewish feeling, and that the two attitudes exist both independently of one another and separately. However, the research also demonstrates that the greater the intensity of anti-Israel attitude, the more likely it is to be accompanied by antisemitic attitudes as well. "Looking at subgroups within the population, the report finds that levels of antisemitism and anti-Israelism among Christians are no different from those found across society as a whole, but among Muslims they are considerably higher on both counts. On the political spectrum, levels of antisemitism are found to be highest among the far-right, and levels of anti-Israelism are heightened across all parts of the left-wing, but particularly on the far-left. In all cases, the higher the level of anti-Israelism, the more likely it is to be accompanied by antisemitism. 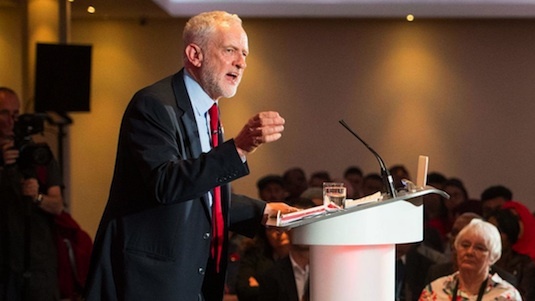 Yet, importantly, most of the antisemitism found in British society exists outside of these three groups – the far-left, far-right and Muslims; even at its most heightened levels of intensity, only about 15% of it can be accounted for by them." However, the left and far left is much more critical of Israel than the rest of the population. However, the research attempts to distinguish between antisemitism and anti-Israel sentiment as two distinct phenomena. There are some very interesting graphs in the report. What's the difference between the hard left and the far left? I've noticed this too, although your articulation of it is much better than anything I've managed so far. It is like large parts of the Corbyn-sceptic Labour world see a different reality to the rest of us. I don't understand entirely why, except for the fact they don't understand what has changed or possess the courage and intellectual tools to begin. a) fair enough to take another pop at my original blogpost, although you've mischaracterised it in the same way as you did first time around. But I quite agree that the whole 'marxist' thing (which I didn't start incidentally, i have owen jones to thank for that honour) was unfortunate with regard to that post, as I did, as you say, refer to some marxian terminology in a loose and tbh pointless way. I tried to correct it in the subsequent blog post, but i accept the point there. More than that though, the main problem with that post was that the things I thought spelled disaster for Corbynism - Brexit and the split in the PLP - actually proved to be his saving grace. Brexit because it polarised the electorate to an unprecedented extent and destroyed the arguments for austerity at a stroke, and the leadership challenge because it motivated Corbyn's support in a way that had not been seen at all prior to the so-called 'coup'. b) I'm not sure how you can deny that Corbyn's entire programme is centered around the trope of the 'rigged system.' He uses it in virtually every speech. You can disagree whether the use of that framing contributes to conspiratorial thinking or not, but i don't see how you can pretend there's 'no evidence' of him using it. c) I would argue that Bennism is actually based on the personalisation of social relations - i'm particuarly thinking about Ralph Miliband's theory of the state etc - which leads to a misrecognition of the character of capitalism, a misrecognition that imo explains what i regard as the nationalist protectionism trajectory of Corbynism. But I'll save the rest of that for the book you won't read! d) Corbyn is absolutely central to the STW 'groupthink' that you rightly criticise. 'My enemy's enemy is my friend' has shaped his politics for decades, which leads to an inability to make political distinctions when it comes to Palestianian internal politics for example - hence all the 'hamas are a force for social justice' stuff, which I'm afraid I fundamentally disagree with. There is mountains of evidence for Corbyn's personal prediliction for conspiracy thinking, whether its to do with 9/11 or the death of Bin Laden. I don't think it is at all irrelevant when it comes to the current situation. I disagree with your characterisation of the debate over israel in the uk, i think there's far more 'israel lobby pulling the strings' stuff than you're letting on. e) we will have to agree to disagree on the important of Postone's work. f) you put your finger on something very important - the rising tide of conspiratorial thinking across the political spectrum. This is precisely why I think the way that Corbynism frames things is potentially so dangerous. As we said in the piece, talking about a 'rigged system' is politically ambigious at best. There are real risks here that Corbynism actually contributes to and intensifies reactionary worldviews, rather than challenges them - particularly if the grand promises it makes fail to come to fruition. g) finally, i found the stuff about my 'establishment backers', my 'mates in Progress', or my desire to 'get noticed' a bit weird. I've seen other people online accuse me of writing this stuff for money, for careerist reasons etc etc. Given i've written a grand total of four articles about Corbynism in three years, two on a personal blog and the others with no payment (and none in the run up to the election, in which i campaigned for labour locally), it seems like a singularly unsuccessful way to build a career. In fact, if i was trying to build a career in left academia/writing, a far better bet would to be leap upon the accelerationist post-work bandwagon, not draw the ire of an increasingly dominant (and i have to say, increasingly authoritarian and agressive) 'movement.' I don't mind people taking the arguments apart, that's fine and I've benefitted from previous criticism. I do mind the ad hominem stuff, although its prevelance amongst the Corbynist milieu does go someway to proving the personalisation thesis. Bolton's analysis is essentially correct, in that Corbyn and the Labour Left do over-personalise many of the traits of capitalism and therefore tend towards conspiracy theories and over-simplification. Yet this analysis needs to be placed in a context where all political tendencies are guilty. Conspiracy theories peddled for decades about the EU as an institution were instrumental in facilitating Brexit, while remainers whine about Corbyn's 'secret' support for the leave campaign and centrists obsess about Trump, Putin and Cambridge Analytica. No party or political group displays any real intellectual rigour or coherent ideology. Hypocrisy is absolutely rife in society and the media, from Islamphobes and Ian Paisley Jnr protesting against Labour's anti-Semitism to ex-cricketers like Michael Vaughan and Kevin Pietersen treating Australia's ball-tampering like some kind of crime against humanity. By all means highlight the problems of 'Corbynism', but by no means should anyone pretend that they don't have much wider roots in the whole present-day political and media culture. This is a great analysis of the shoddy work of Matt. His reply above, especially shallow comments such as this,'I'm not sure how you can deny that Corbyn's entire programme is centered around the trope of the 'rigged system.' May point towards the fact that maybe he's just not a great thinker. I mean you clearly stated in this article the Bennite roots of Corbyn's thought and all that comes with, so to then reduce his whole programme to rhetoric around a 'rigged system' is ridiculously reductive. This is just one point of weakness in the many you point out. Great job. The notion (Matt’s, as I understand it) that describing the system as rigged promotes conspiracy thinking is bizarre when Marxist analysis is precisely about structural bias, surely?! At the same time, in the ‘real world’ (cringe) structures don’t exist without agents, actors and, indeed, conspiracies: cartels, etc. Using this outlet, did you hear your former employer on BBC Radio 4 Any Questions last night? He said he was now a "floating voter" would have backed Macron were he French and championed David Miliband as the King over the water for any new Centre Party.